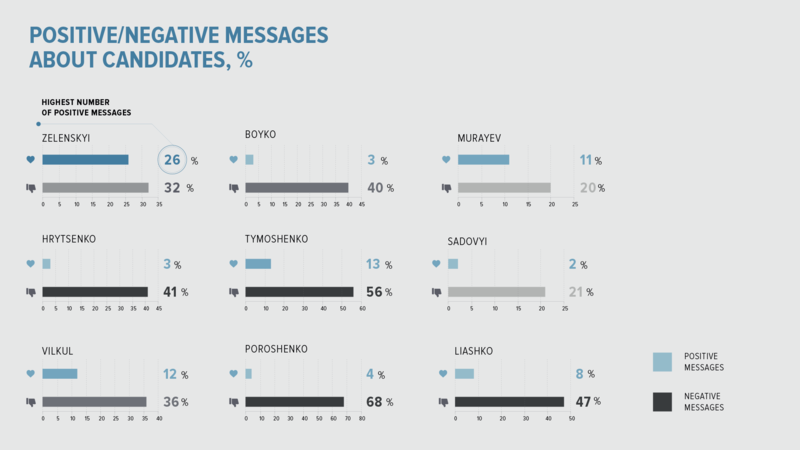 The analysis of nearly ten million posts [published between 1 November 2018 and 14 February 2019] on the Russian social network VKontakte confirms widespread negative coverage about Ukraine’s presidential candidates, with 68% of messages about Petro Poroshenko being strongly negative and derogatory. Poroshenko was alternatively dubbed a Russophobe, a “bloody Ukrainian confectioner,” “the worst President,” and “the chocolate Fuehrer”, among other insults. 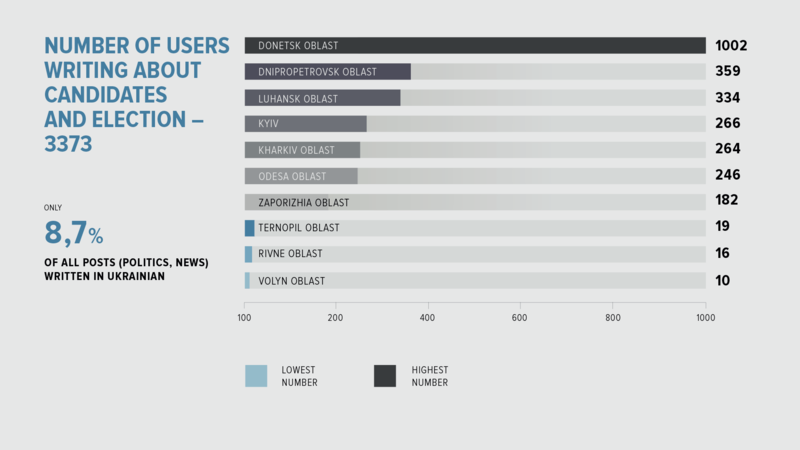 Interestingly, the study by Internews Ukraine reveals that pro-Kremlin candidates were also subjected to mostly negative coverage, while Ukraine and Ukrainians, in general, general were described in highly pejorative terms such as “bourgeois scum,” “stinking hypocritical animals,” “little juntas,” and “Khokhlo-faggots” (Khokhol is a derogatory Russian term for ‘Ukrainian’). Anti-Semitic messages were also prevalent across the sample of posts. Meanwhile, the war in Donbas was presented as a war between pro-Russian “Slavs” and pro-Western “Judeo-Masons” who, according to Russian mythology, wish to dominate the world using Jewish capital and information assets. Some 3,373 VKontakte users posted about Ukraine’s elections from 1 November 2018 to 14 February 2019. The links they shared derived primarily from pro-Kremlin sources pushing common anti-Ukrainian messages. It is noteworthy that such narratives – e.g., that Ukraine does not really exist or is a “failed state” drowning in chaos – which are aggressively pushed by Russian TV channels and pro-Kremlin websites also flourish on the Ukrainian VKontakte sector. 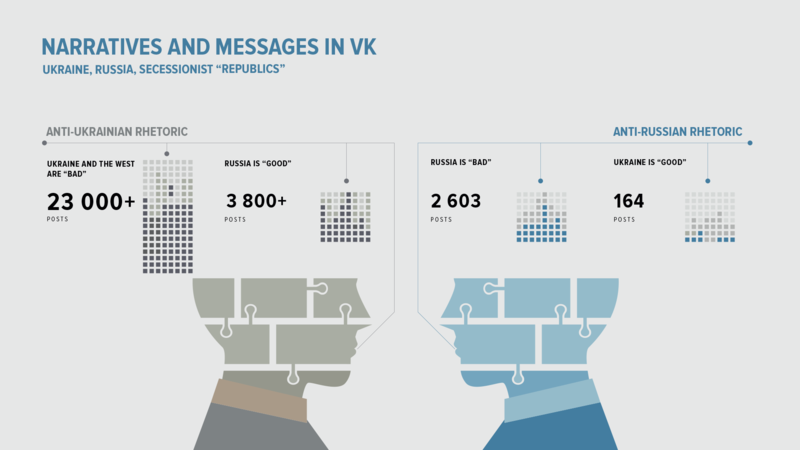 The analysis identified over 23,000 posts characterizing Ukraine in negative terms, but only 2,603 posts characterizing Russia the same way. VKontakte’s popularity in Ukraine has been dwindling since 2017 when Kyiv placed sanctions on certain Russian internet products. Even so, it is estimated that tens of thousands of people still use the social network in eastern Ukraine and Kyiv.